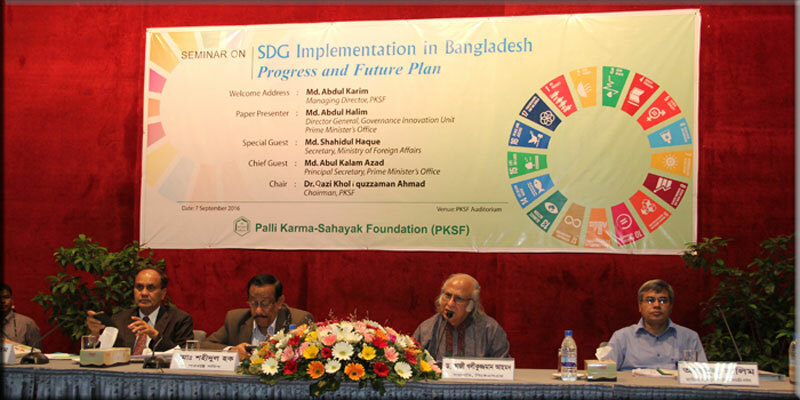 Palli Karma-Sahayak Foundation (PKSF) organised a seminar on “SDG Implementation in Bangladesh: Progress and Future Plan” on September 07, 2016 at PKSF auditorium. 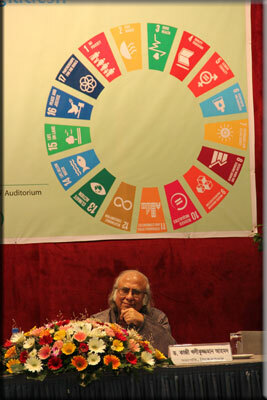 Dr. Qazi Kholiquzzaman Ahmad, Chairman, PKSF chaired the programme. Mr. Md. 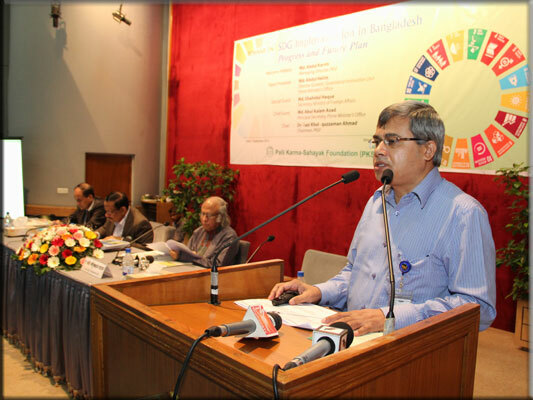 Shahidul Haque, Foreign Secretary, the Government of Bangladesh was present as the chief guest of the seminar. Mr. Md. Abdul Halim, Director General, Governance Innovation Unit (GIU), Prime Minister’s Office made a presentation as the keynote speaker. Mr. Md. Abdul Karim, Managing Director, PKSF delivered the welcome speech in the seminar. Government officials, noted personalities, academics and experts, officials of PKSF and CEOs/representatives of Partner Organisations (POs), students and journalists attended the seminar. In his welcome speech, Mr. Md. Abdul Karim said that PKSF is operating a programme in a holistic approach called ENRICH in which a number of SDGs have been taken into account with adequate importance. He noted that Bangladesh truly did well in achieving MDGs and obviously would make significant progress in implementing SDGs. 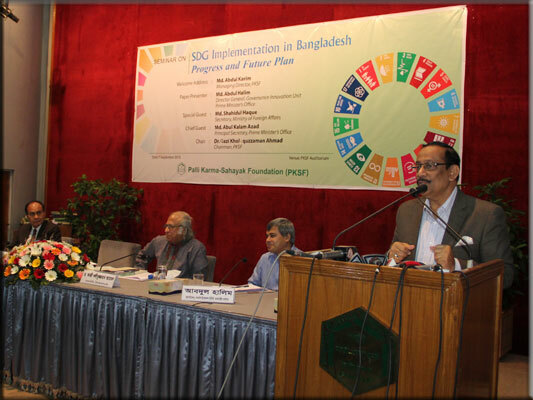 In his presentation, the keynote speaker Mr. Halim asserted that despite some limitations, Bangladesh has already started implementing SDGs. He further stated that there must be an accord between economy, society and environment in the process of implementation of SDGs. Mr. Md. 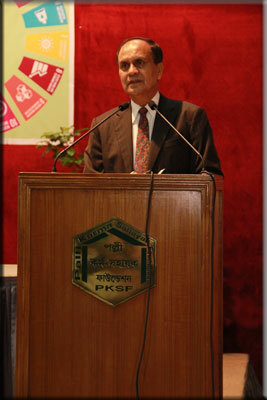 Shahidul Haque, the chief guest of the seminar focused on the importance of good governance. He said that SDGs are fundamentally different from MDGs and in the upcoming UN General Assembly Bangladesh will try to highlight some of the new development issues. Dr. Ahmad, the Chairperson of the seminar, remarked that implementation of SDG should be made in an inclusive approach. He stressed that the Liberation War of 1971 was fought for equity and SDG is focusing this concept to remove disparity across the globe. Later, he moderated a participatory and lively open discussion session.